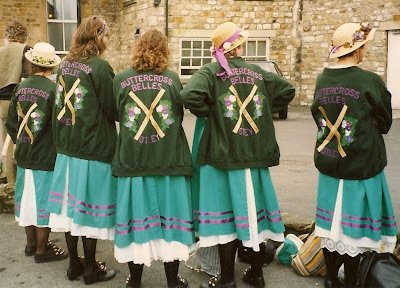 In November 1995, the Buttercross Belles proudly wore their newly designed appliqued cardigans for the first time. The cardigans, over the years have been very well worn and 14 years later (although the beautiful applique is as good as it was when new), sadly the cardigans had started to ware. In mid 200 9, it was brought up at the AGM to possibly look into having some new cardigans for the side. A straight cut cardigan was seen as the best option as when the original cardigans were fastened, it pulled the skirt of the dress in and spoilt the shape of the smock. It was also suggested that the design could be amended to fit the current side (the side no longer use sticks in dances as it shows on the original cardigans). 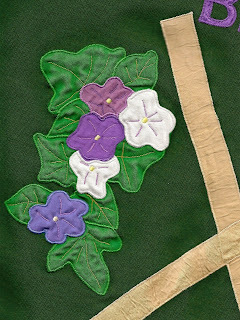 The flowers on the original design were very popular with the Belles, and are somewhat unique, so it was decided that the new design was to incorporate similar flowers. 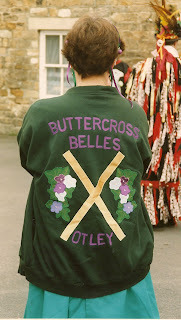 There was also descussion about wherther we needed to have 'Otley' on the back of the cardigan. It was decided it was to be on the design, as its a conversation starter on dance outs and shows spectators where we are from and who we are. 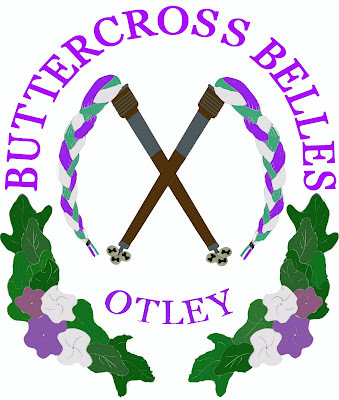 Places such as Chorly, Oxford, and even Brugges and Switzerland, we get people coming up to us saying 'Otley? I used to live there', 'its such a loverly place' or 'I live in Harrogate' and such comments. On the new design, the slings (bobbins with plates) replaced the crossed sticks, with the plates forming a follow through oval, which leads into the rest of the design. We decided to change the colour of the cardigans for two reasons. 1. As we ware black tights and black Tap shoes, it was seen as fitting to the overall out fit, and 2. the design stood out better on a black background, bringing the purples, white and pink out in the flowers and the vivid green of the leaves. We received the cardigans on the 11th March, just intime for the anual Mothers Day dance out at Bolton Abbey.